Home off page seo search engine optimization website optimize How To Load Your Website In 2 Seconds? How To Load Your Website In 2 Seconds? The growing culture of impatience has made people less tolerant towards waiting. It has affected so much so that waiting a couple of extra seconds for a page to load feels like an eternity. People like fast websites and so does search engines. Website load speed are surprisingly important for SEO as they can make a huge difference in the ranking war. Clearly, increasing the page speed of your website is critical, not only for ranking but, to enhance user experience too. 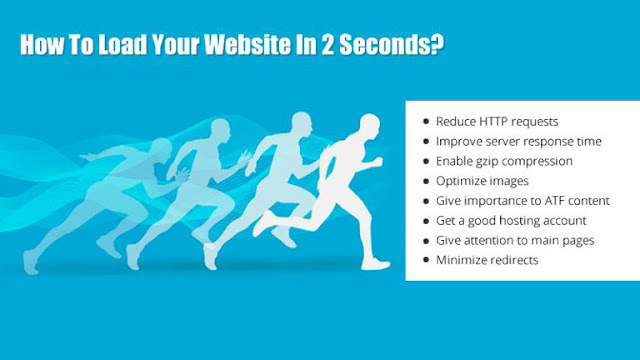 Now, let’s jump in and improve your website’s performance. Every single HTTP request adds more time to the loading speed of your website. Reducing the requests can be beneficial to your website as users needn’t wait long to see your website. By minimizing the requests, you can increase usage metrics, such as time spent on site and pages visited. It is now possible to reduce HTTP requests without destroying the design of your website. Minimize the usage of design and functional images. Reduce the number of supportive files. It is recommended that you reduce your server response time to 200ms. According to Google, these are the potential factors that may slow down your server response time. When you have the necessary data in hand, figure out how to address the problem. Once the issue is resolved, continue measuring your server response time so that you can quickly address future performance issues. Note: Google’s PageSpeed Tools can give you more information related to performance related best-practices. Tuning the performance of your website is important. From a user perspective, reducing network transmission and bandwidth is also important. This is where gzip compression comes in. Websites that have implemented a mobile SEO solution should pay attention to redirects on their pages. As more people use mobile to surf, redirects will become a big problem. It affects mobile users highly as they use a less reliable mobile network than desktop users. Do you need help to improve your website performance?